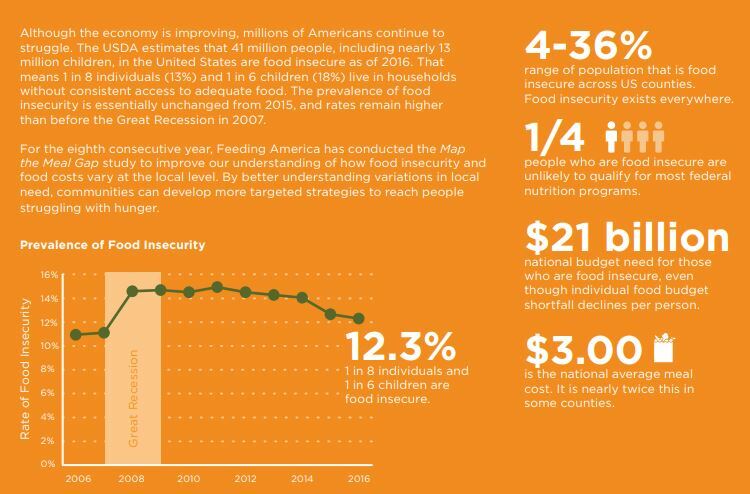 These charts are from Feeding America, specifically “Mapping the Meal Gap” and are 2016, released in 2018. Food insecurity refers to USDA’s measure of lack of access, at times, to enough food for an active, healthy life for all household members and limited or uncertain availability of nutritionally adequate foods. Food-insecure households are not necessarily food insecure all the time. 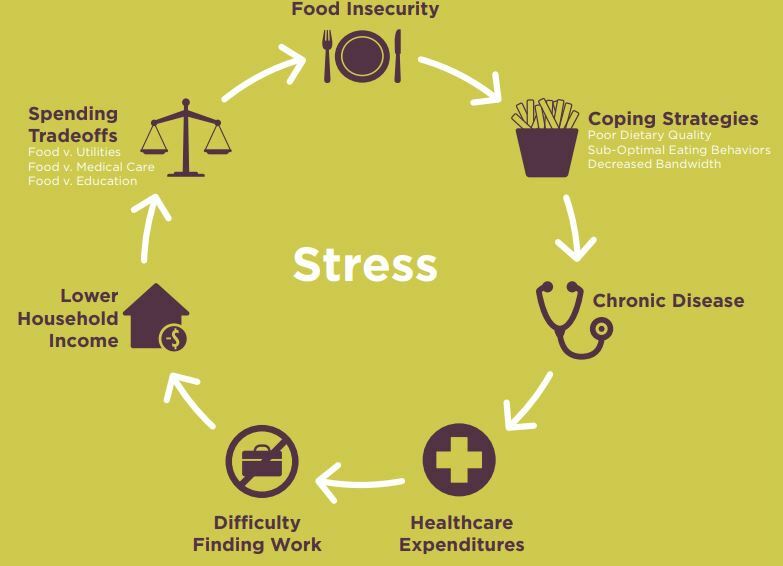 Food insecurity may reflect a household’s need to make trade-offs between important basic needs, such as housing or medical bills, and purchasing nutritionally adequate foods. It does not exist in isolation, as low-income families are affected by multiple, overlapping issues like affordable housing, social isolation, health problems, medical costs, and low wages. In addition multiple medical conditions are associated with food insecure populations include high blood pressure (hypertension), coronary heart disease (CHD), hepatitis, stroke, cancer, arthritis, chronic obstructive pulmonary disease (COPD) and kidney disease based on a 2017 study by the US Department of agriculture. “Income is significantly associated with only 3 of the 10 chronic diseases — hepatitis, arthritis, and COPD—while food insecurity is significantly associated with all 10,” the study’s authors write. Conditions have improved over time due to the presence of better food distribution and greater understanding of the problem. In America food insecurity was 12.3% in 2016 (average meal $3.00). Virginia in 2015 was at 10.6% (average meal $3.07). America’s figure was higher in 2015 at 13.4% though the average meal was also slightly lower at $2.94. Virginia was also higher in 2015 at 11.2%, (average meal $3.03 ). The Village Harvest serves Caroline, Essex in particular with some clients from King George and Westmoreland. Below are the statistics of nearby counties. The most significant need is Essex County with the highest food insecurity rate at 15.2% (down from 15.7% in 2015). 48% are also above the SNAP threshold of 130% poverty (compared to 51% in 2015).